Every year the Apocrean Harvester visits Spiral Knights and brings along some goodies. This year the event started on June 2 and will run until June 16. During that time you’ll be able to work towards the unique and powerful apocrean weapons. The apocrean weapon lineup consists of the obsidian carbine, crusher, and edge. Each weapon comes with a combination of shadow damage and poison status; a great combo for slime and gremlin monsters. The event also brings the Obsidian Prize Boxes to the supply depot. For 2,600 energy you can nab a box and have a chance at unlocking some rare apocrean cosmetics. The two most sought after items in the boxes are the Apocrean Crown and the Apocrean Disciple Wings. The crown has a 2% drop rate and the wings are at 1%. Yeah, good luck. While the boxes are nice, not having a guaranteed goal to work for can be a little frustrating. The weapons may require a bit of grinding to earn, but a guaranteed and playable prize awaits those that have the patience to work towards them. Over the past few years I’ve been able to unlock all three weapons and test them out in Spiral Knights. 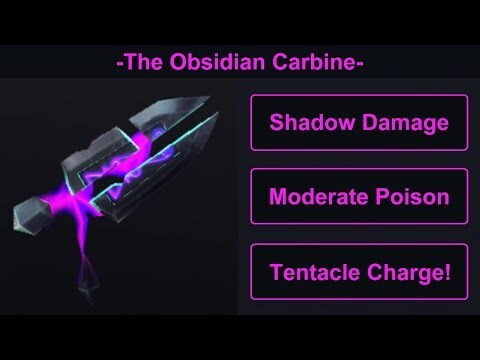 The below video showcases the Obsidian Carbine. The demos for the edge and crusher are also on YouTube and can be accessed through the links.Check out the official forum post for more details on the event. What’s your favorite apocrean weapon?